Houston Grand Opera continues its stride with year two of their six-year Benjamin Britten cycle with their enchanting production of A Midsummer Night’s Dream. Combining Shakespeare and opera comes with a set of dilemmas, such as how to edit, add, and hopefully not mess with the Bard’s impeccable sense of structure. And for all purposes, Britten managed to frame his Midsummer in a way that does the least harm to this famous play, even adding a line to make it all work. Extra credit for that. Welsh countertenor Iestyn Davies’ Oberon added an eerie and otherworldly touch as he flies about in his Wizard of Oz floating carriage, donning a spectacular feathered headress. Laura Claycomb, in a mile long blue fabric train, gave Tytania a cool and goddess like distance, tempered by her ethereal presence and soaring sound. Baritone and HGO studio alumnus Liam Bonner’s Demetrius hit projected a leading man authority. British bass-baritone Matthew Rose’s Bottom was a joy to behold. His intense physicality, comic timing, expert buffoonery, and robust sound dominated in a good way. His band of Rude Mechanicals, known as Rustics in Britten’s world, amped up the hilarity in the third act. Tenor Norman Reinhardt delivered a convincing performance as Lysander. 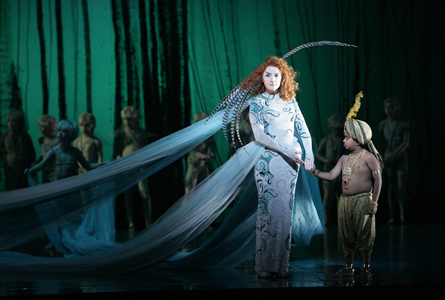 Marie Lenormand charmed as Hermia, and Katie van Kooten made an impressive HGO debut as Helena. Actor Jon Michael Hill’s Puck grounded the proceedings in Shakespeare’s delicate prose and delivered a lively performance. Neil Armfield directed with eye for the dominance of the fairyland and for the more subtle ways a Britten opera plays out. The pacing of the first two acts felt a tad tedious, but the action and fun picked up in the final act. Dale Ferguson’s sets and costumes conjured a pastoral dreamscape, and a stern geometric Athenian world, visually balancing logic vs. nature. Ferguson frames his enchanted forest under a flowing, breathing sea green cloth, evoking a fluid and watery mood—a good reminder that we have left the world of law and logic. The HGO children’s chorus, under the director of Karen Reeves, added wonder and whimsy. Patrick Summers and the HGO Orchestra brought Britten to life with a crisp and subtle performance. Even Buddy, a sheepdog making his HGO debut, managed to bark on cue and on pitch. How’s that for magic?